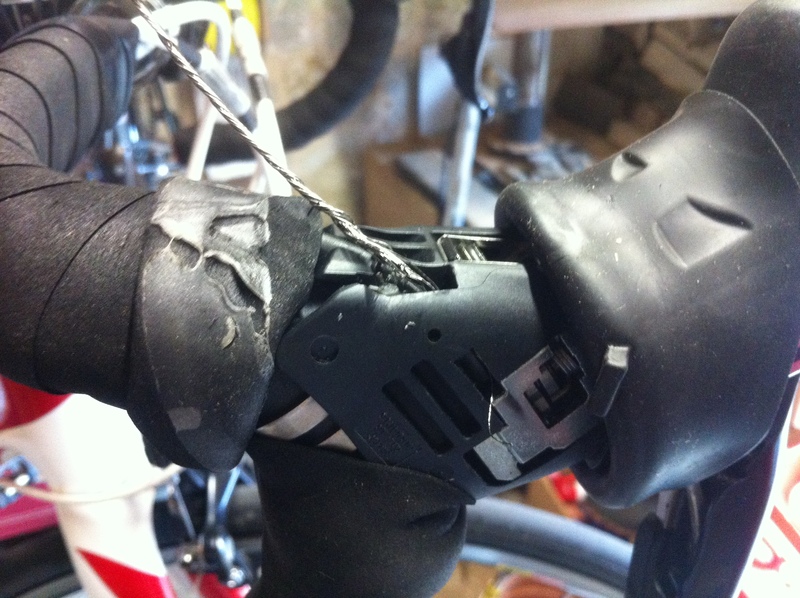 Have you changed your shifter cables recently? Shimano and Campy riders should change rear shifter cables every three months under heavy use (200+ miles per week), every six months under light use. You may get longer out of your cables, but if you want to limit the risk of cable failure during a race or event frequent changes are recommended. As riders only shift the front derailleur a fraction as often as they shift the rear, front cables generally last longer. Shops in Florida and other dead-flat states hardly see broken shifter cables at all due to how seldom riders shift. In order to minimize damage from a frayed cable, if your shifting begins to work erratically, do not down-shift as this will only pull the frayed cable deeper into the mechanism. Try up-shifting—if your bike won’t up-shift, or if it labors to up-shift you may have a frayed cable. Leave your bike in one gear, pedal home easy, and change your cables!